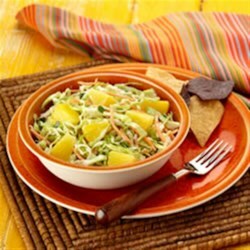 "Pineapple chunks, cumin, and a spicy ranch-style dressing bring a tangy, new dimension to traditional cole slaw." Combine pineapple chunks and coleslaw in large bowl. Stir together salad dressing, cilantro, cumin, salt and garlic. Pour over salad; toss to evenly coat. Sprinkle corn chips on top, if desired.